Water voles are one of the stars at Portbury Wharf. 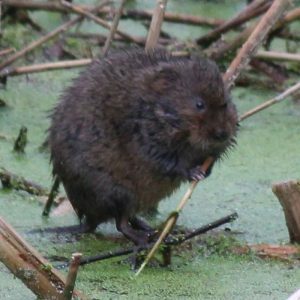 The water vole has been described by Britain’s Wildlife Trusts as “Britain’s fastest declining wild mammal” so we are very lucky to have them here. The greatest threats to water voles are thought to be loss of habitat and attacks by mink which can kill an entire colony. Water voles are protected in the UK under the 1981 Wildlife and Countryside Act. To thrive they need undisturbed freshwater surrounded by lush vegetation to eat. They excavate tunnels into the river banks where they nest and have their young between March and September. The tunnel entrances can be both above and below the water. Is it a water vole or is it a rat? DID YOU KNOW? Water voles have a more rounded nose and chubbier face than a rat, with a furry tail and small furry ears. Water voles are about the size of a small rat and can easily be mistaken for a rat. However they have a much more rounded body, chubbier face and blunter nose. Their tail is shortish and furry while a rat’s tail is bald and longer than its body. The ears are different too, a rats ears are easy to see unlike the water vole’s which are furry and almost hidden. Water voles are like corks, very buoyant, so when they swim they are high up in the water. Where am I likely to see a water vole at Portbury Wharf? They live in and around water, well they would wouldn’t they with a name like that! The best place to see them is in the rhynes, the water filled ditches throughout the reserve. You might see one in the rhyne running alongside Water Vole Lane, the path heading towards the Severn Estuary. Listen out for a “plop”, this is the sound of one diving into the water. They have many predators but the most dangerous is the mink. Hopefully Portbury Wharf remains mink free but let us know if you see one. We can make sure we do not disturb them and keep our pets away from the water. They feed on the plants growing alongside the rhynes so it is important not to trample on their next meal. 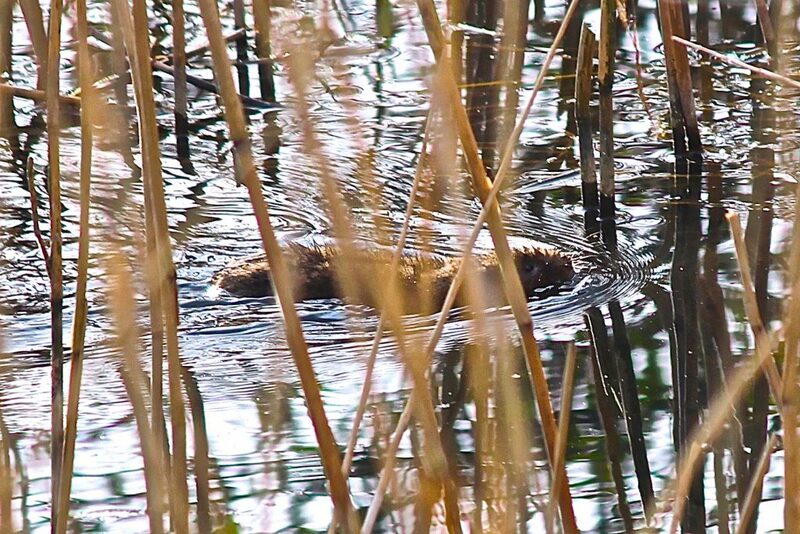 The first video was filmed at Portbury Wharf . . .
. . . and the other is an excellent Quick Guide to Water Voles from http://watervole.org.uk. Error: Error validating access token: Session has expired on Sunday, 31-Mar-19 15:12:08 PDT. The current time is Saturday, 20-Apr-19 13:20:32 PDT.